I received a GE reveal® LED Light Bulb and was asked to write about it. Besides being given the light bulb, I was not compensated in any other way. Also, I’m sort of a lighting nerd. I use lighting at work for photo and video production, and I’m very particular about much of the lighting in my home and office. 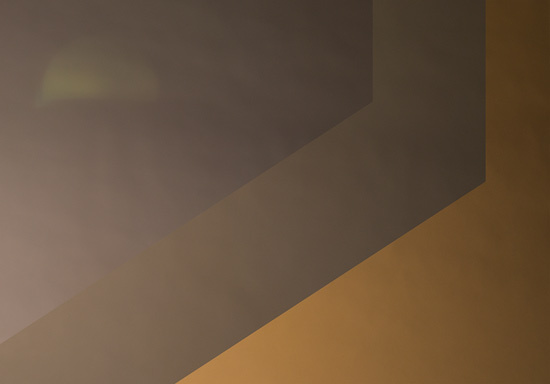 If you want to see some of the typical comparisons, check out the GE reveal® Lighting page. The info I’ll provide below is a bit different. This is a standard compact florescent light bulb. I sort of hate CFL bulbs. I find the light they produce quite terrible, and the big clunky base of the bulb is annoying. From a design standpoint, I find the spiral ridiculous. I do like the energy saving potential of the CFL bulbs, and we do use some around the house, but overall I hate them. This is a standard incandescent bulb. I love these bulbs. They tend to produce a nice quality light, and they are cheap, and the design is beautiful. When I think of a light bulb, this is what I picture. Of course, these are quickly becoming illegal (sort of) and being phased out. Sadly, at some point in the future, you won’t be able to buy incandescent bulbs in the United States anymore. Sadness! This is the GE reveal Bulb, which, design-wise, is close to an incandescent bulb, which is nice, especially if you have shades that go directly on the bulb. (Yes, older lamp shades did have a metal clampy thing that went right on the bulb. I still have some of those lamp shades.) 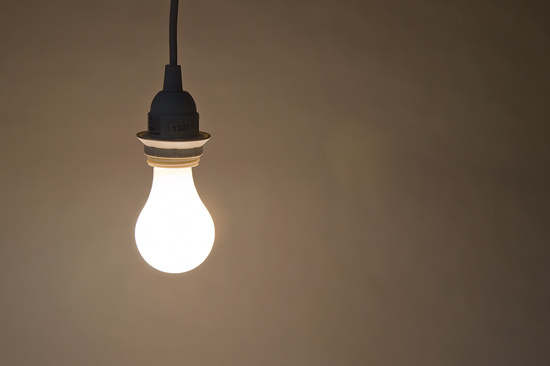 One of the benefits of this bulb is that it matches the physical shape and size of the old incandescent bulbs. That’s a big improvement over the CFL bulbs. As for the quality of light, it’s a pretty nice light. I found it to be just a little cooler than the incandescent bulb… in a good way. I definitely like the light it produces. The LED bulb gives off a great light! Slightly better than the incandescent, and much better than the CFL. One little annoying thing about the design is that you only get light from half of the bulb. 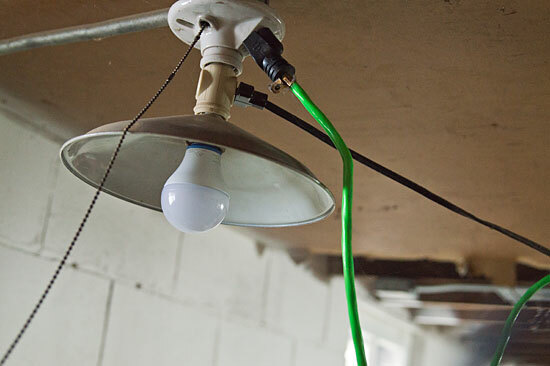 I know this is due to having to shove all the electronics into the other half of the bulb, but I can see this causing issues in some situations where you actually do want light spilling out in every direction. When I put in the GE reveal Bulb, it did not work. I tried a few times. I also pushed the bulb up against the fixture, and no luck. It’s worth noting that the socket is a bit wobbly, but the LED bulb just did not work. Maybe there are some sockets it won’t work in? I should also note that I weighed the three bulbs, because I was curious about the weight. The compact fluorescent bulb (the largest I have in the house) weighed in at 6.4 ounces. The good old incandescent bulb was 0.99 ounces. (Yes, it was less than an ounce!) 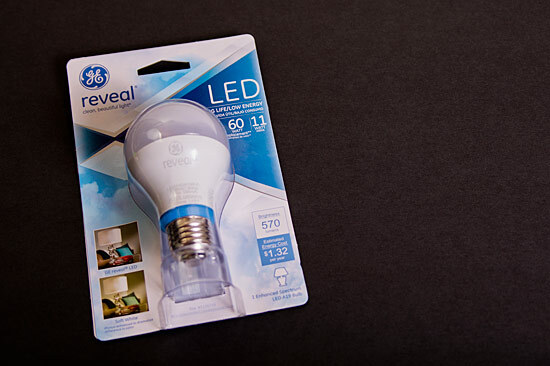 The GE reveal LED bulb was a whopping 7.3 ounces. That’s a heavy bulb! I can see this causing some issues if you’ve got a lamp that may already be top-heavy. I guess if we’re moving to a world were we have to convert high-voltage AC power to low-voltage DC power in every bulb, that may be the price we pay. I moved the GE Reval bulb to another socket and it worked fine. This light also had a metal shade on it which would normally reflect light down, but since the GE reveal bulb doesn’t really shine light up due to the half-bulb design, the shade probably doesn’t do much. But hey, the bulb worked… that’s good! 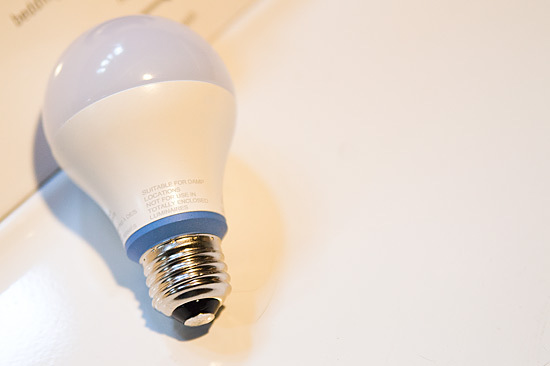 There’s one more feature of the GE reveal bulb I’m really excited about… it’s dimmable! Yes, there are dimmable CFL bulbs, but none of the ones I have are dimmable, and the ones that are seem to be pricey. 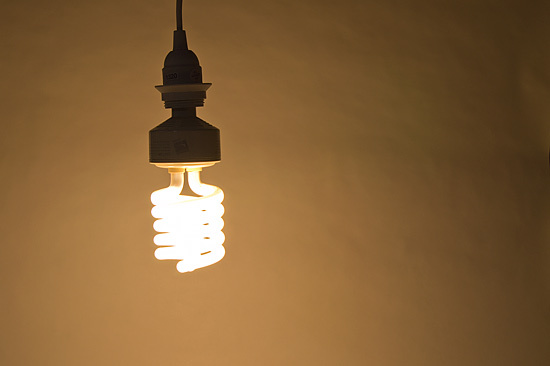 Incandescent bulbs excel when it comes to dimming. I put the GE reveal bulb in our bathroom fixture and it did indeed dim. It did not go as dim as my incandescent bulbs, but hey, it did work. I then tested it in an X10 controlled lamp, and the results were much better, though there did seem to be a slight flicker at the lowest setting. GE is marketing this bulb to people who want to have beautiful light in their home (or elsewhere) to “reveal” the decor and surroundings, and for that, I’d say this bulb does the job. It provides a lovely light, and is well designed. A quick search online revealed this bulb to cost about $20, which is ten times what you might pay for an incandescent bulb. 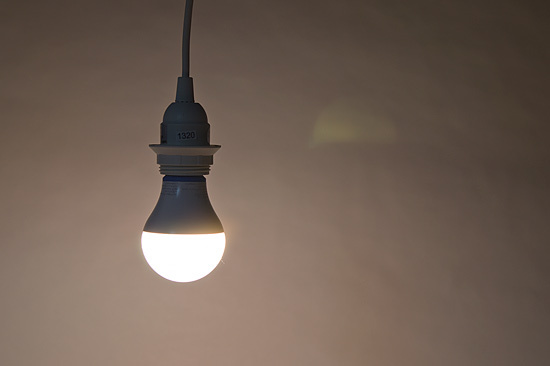 Of course the LED bulb should be more energy efficient, and should last much longer. In theory. So that’s my review of the GE reveal® Light Bulb. Pretty much everything in this review had to do with testing, evaluation, and my own opinion. Now that’s all of that is out of the way, I’ll put the bulb into place and give a real-world test for a while, and then if I have new insights, I’ll share those as well. Posted on Sunday, February 16th, 2014 at 12:49 pm. Subscribe to the comments feed. Both comments and pings are currently closed. Post on your own blog. I’ve replaced several of the CFLs in our home with LEDs. I could be wrong about this, but I think one of the other benefits of LEDs over CFLs is that they don’t seem to get nearly as hot. Probably I’m being a little paranoid, but the heat makes me a little nervous if I’m not home. Also, they don’t seem to take long to warm up like CFLs and apparently don’t suffer as much longevity damage from switching off and on. Finally, aren’t CFLs hazardous if broken? On the other hand, they are super expensive up front compared to the other lighting methods. Oh yeah, I’ve seen CFLs that have yellowed a bit on the base, due to excessive heat I assume. And CFLs do seem to take a while to get to full brightness. The cost of LED is definitely a concern, and will they really last 10+ years? No clue. My only complaint so far with LED’s are the candelabra base units currently on the market. 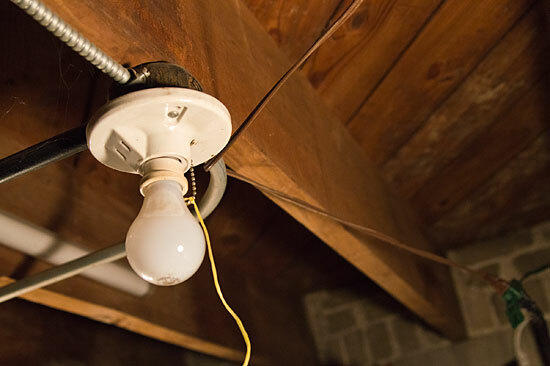 As you noted, the base of the bulb is reserved for some of the various bits needed to supply power to the LED, and in fixtures, like for example, our kitchen ceiling fan, means most of the light is directed upward, where a traditional incandescent projects all around pretty evenly. I will say though, overall the designs and quality have improved pretty well from the first LED bulb I bought in 2008, and the prices have dropped some as well. Pete, how has your experience been with life of the CFLs? For something that is theoretically supposed to last 3x, 9x, 1google times longer (or whatever the claims are) than incandescent bulbs, I have found in my house they do not seem to last longer as a whole. I have given up on them and have gone with LEDs…as bright as I can find. The CFLs just seem dim to me; the LEDs I have replaced them with in our track lighting in the kitchen finally seem to be close to the good ol’ energy waster incandescent bulbs. Hopefully these suckers will last as the price definitely isn’t worth if it the LEDs don’t last as long as advertised! It’s hard to generalize about CFLs– color varies all over the place, some have to warm up and some don’t, some last longer than others. I do think the higher-powered ones tend to burn out faster, which is disappointing. The industry has tried to do better with the LEDs, although there will always be someone trying to cut corners. They’re doing a much better job of labeling the different colors. At least some of them are pretty good, and I’m not sure I’d say that about CFLs. 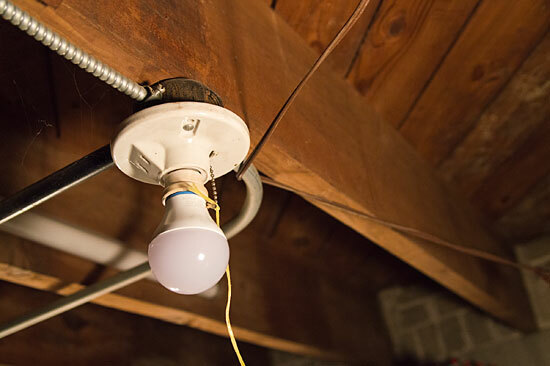 Incandescents burn out too fast, and they generate enough heat to cook the fixture if it’s not designed right. I’m only going to buy LEDs from now on. Ron, I don’t know that I’ve actually ever bought any CFL bulbs, as I hate them. I’ve moved into houses and worked at places that have them, so that’s my experience with them. I’ve been a fan of incandescent bulbs, so that’s what I’ve been buying for years. Scott, I think I’ve had some CFL bulbs fail, but I don’t track that, probably due to my moving so much in the past 10 years. My parents have a huge house with LOTS of lights that are always on. Once, I snuck over there and replaced a few bulbs with CFLs. My mom never noticed, but it helped cut down their electric bill a bit. Another trick that I have been doing is to write the installation date on a bulb with a marker. That way, when it finally does die, you know how long it actually lasted.